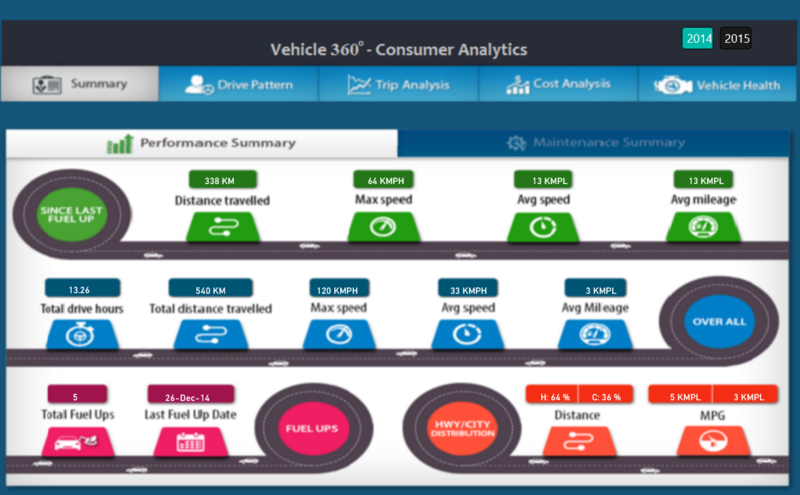 Vehicle 360o is a pre-built BI Analytics product that provides advanced analytics to Automotive Enterprises, Fleet Operators, and Consumers helping them better understand vehicle performance, reduce vehicle maintenance and operating costs, suggest optimum driving and maintenance parameters. Cognizant's BigDecisions(TM) is an end-to-end BI and analytical business solution platform with pre-built KPIs and Business Apps to enable clients leverage structured and unstructured data to derive meaningful insights and foresights into businesses. 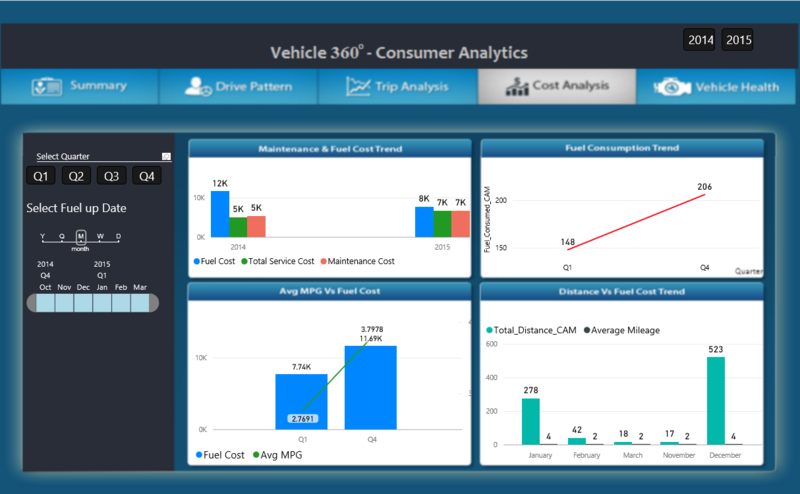 Vehicle 360 Biz App is a domain solution built using Cognizant’s BigDecisions(TM) Framework. Vehicle 360o Biz App helps to achieve improved product quality and vehicle experience, recall avoidance, reduce warranty costs for Automotive Enterprises. 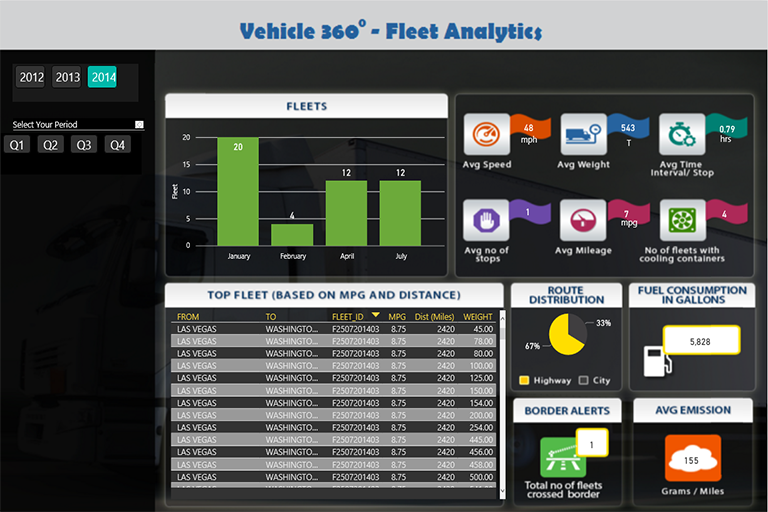 For Fleet Operators and Consumers it helps with real time tracking, advanced safety and security, interactive fault diagnostics and so on. Vehicle 360 solution is an IoT and cloud based solution which will ensure availability of real-time information, with no upfront infrastructure setup and reduced maintenance cost. 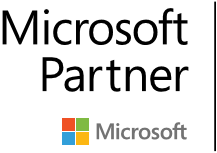 The solution will provide visibility into vehicle health, emissions, mileage, driving patterns, and device performance patterns. Converting insights into business decisions which helps Auto manufacturers to address business plans such as deciding production volume and maintaining standard mileage value for different models.